Heart failure is the first-listed diagnosis in 875,000 hospitalizations, and the most common diagnosis in hospital patients age 65 years and older. In that age group, one-fifth of all hospitalizations have a primary or secondary diagnosis of heart failure. With nearly 5 million Americans currently living with heart failure and approximately 550,000 new cases are diagnosed in the U.S. each year, it’s important to have the most complete education possible for patients. Heart failure is responsible for 11 million physician visits each year, and more hospitalizations than all forms of cancer combined. 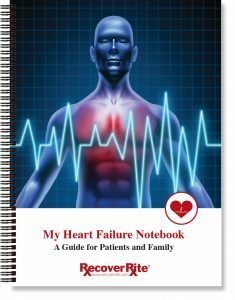 Our Heart Failure Notebook will help you patients manage their condition and reduce trips to the hospital.